I miss crackers. Sometimes you just need something crunchy and something to dip that is still grain free. I have made almond flour crackers before but I used my own homemade almond flour. They tasted great but they broke easily and were very tender, almost soft. I think that had something to do with the fat content in it. This time around they were perfect as I used store bought almond flour. They were super quick and easy to make and were crunchy, not soft or crumbly. I ate them with my homemade chicken liver pate and they were exactly what I was craving. Here is what I did. Preheat oven to 325. Mix everything together with your hands. If the dough is a bit dry and won’t quite hold together you can add 1 tsp of water at a time until it just holds together. When everything is well mixed and the dough sticks together transfer it in a ball onto a piece of parchment paper. Press the dough down to flatten it a bit then cover with a second piece of parchment paper and roll the dough out until it is uniformly to the desired thickness. If the sides crack apart just push them back together a bit. Carefully transfer the rolled cracker onto a large cookie sheet. The flattened dough should take up most of the sheet. Score with pizza cutter into small squares. Sprinkle the tops of the crackers with a coarse sea salt. Bake for 20 minutes. Check for light browning the crackers. If they are not browning yet bake in 5 minute increments until they are. If they are not baked enough they turn out a bit soft. If they are too brown they don’t taste as good. When they are done leave them on the cookie sheet to cool completely. They firm up and become crispy once they are cool. When cool break them apart and store in an airtight container. You don’t like almond flour, hey? My favorite flour is teff but I feel better if I don’t eat any grains so for me almond flour is the next nest thing. I think it is more versatile than coconut flour. I love these with canned oysters. I love oysters but I can not get them down without a cracker or toast. I hope you like them as much as we do. These look great!! But can you tell me if you “transfer” the rolled cracker dough to the cookie sheet with or without the bottom parchment sheet attached? Thanks!! I bake them right on the parchment paper and let them cool on it too. They are a bit crumbly until they are totally cool. After that they are great. Good luck! My face breaks out when I add flax to anything. I thought it was oily. If so, what could I use to replace it in your recipes that wouldn’t have the same effect on my skin? On this recipe I would try it without. I made these just yesterday and needed two egg whites so just play with it until it holds together. I think it should be fine without flax. 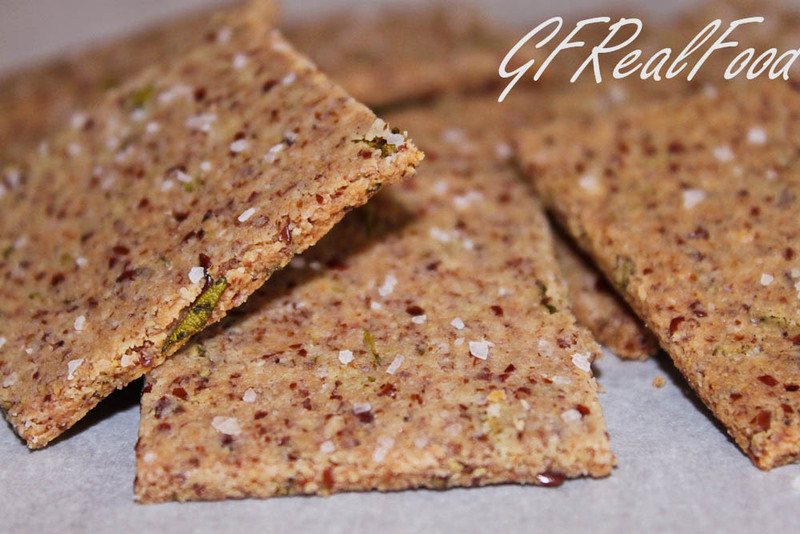 Thanks, I think this is the easiest GF cracker recipe I’ve seen. I love rosemary and I have all the ingredients on hand. I like Mary’s Gone Crackers, but a cheaper homemade recipe would be nice. Will report back when I try it! I’d love to hear how it works out for you. I love these crackers. At home we’ve been dairy free/gluten free for 3 yrs. To overcome allergies for the whole family I’ve been looking into GAPS diet. I find it easier cooking soup every meal except when we are eating out. My next challenge is to find portable snack food that we can take with us. So thankful for the recipe on your blog that has gluten free, GAPS, Paleo recipes. I am a true believer in GAPS. I have seen some amazing things with it. For myself though I just couldn’t get through the soup phase. I love soup but not everyday. It got to the point where I stopped eating. I just couldn’t stomach it. I couldn’t even look at it anymore. So hats off to you that you can make that work and have found great success in it.